This crochet shamrock pattern is a perfect St. Patrick's Day project. You can make one as an applique, then add it on to a variety of other projects. For example, you could stitch one on to a simple scarf. It would dress up the design, plus you would avoid getting pinched on the holiday since you're wearing the traditional green design. Of course, if you don't want to wear this crochet shamrock, you could use it in other ways. Create a string of them to hang together as a garland for decor. You could even make the design in other colors to create bunting to use throughout the spring. For example, a string of pastel shamrocks would work for an Easter party and well into the rest of the year. ​This crochet shamrock pattern is for a classic three-leaf clover. However, the four-leaf clover is the one that people consider "lucky" so you might want to make an extra shamrock leaf. No problem; you can adapt the instructions accordingly to make a four-leaf clover if you wish. The final leaf is made the same way as the second and third leaves, sitting next to the third leaf before you add the stem. Use crochet thread size of your choice or yarn weight of your choice and the crochet hook that best matches your yarn choice. This example was worked in a worsted weight yarn using a size G aluminum crochet hook. The clover's finished sizes will, of course, vary depending upon your choices. Using lighter thread and smaller hooks will make tiny shamrocks. 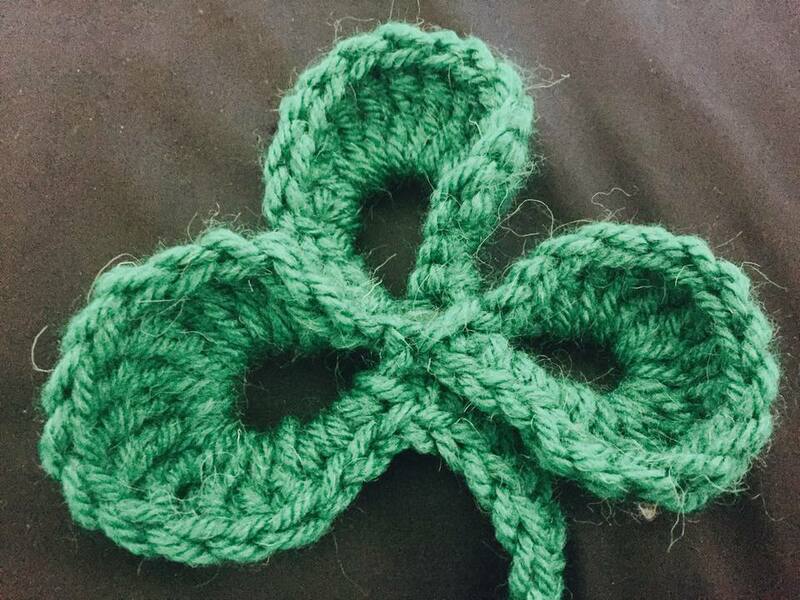 In contrast, using bulky yarn and big crochet hooks will make large, cushy shamrocks. Make a bunch in various sizes for a terrific St. Patrick's Day display! Although shamrocks are normally green, you can make yours more unique by choosing different yarn colors. Have fun playing with the options! First Leaf: work (3 sc, 3 dc, 6 tr, 3 dc, 3 sc) all in the ch-10 circle just made (first shamrock leaf formed). Second Leaf: Ch 10, sl st in the 10th ch of the beginning shamrock chain (this is the same spot as the base of first leaf made), for next leaf: work (3 sc, 3 dc, 6 tr, 3 dc, 3 sc) all in the ch-10 circle just made. Note: you may need to rotate the work around so that the first leaf is to the right of where you will be working the second leaf. Do not turn the work over but instead rotate it towards your hook until your hook is in the right position to work into the circle you've created with the ch-10. Third Leaf: Ch 10, sl st in the 10th ch of the beginning shamrock chain (in the same spot as the base of the last leaf made), work (3 sc, 3 dc, 6 tr, 3 dc, 3 sc) all in the ch-10 circle just made. (You may once again need to rotate the work to be able to work easily into the circle.) Sl st in base of leaf. Do not end off; you will continue with the stem. Note, if you wanted to make this a four-leaf clover then you would add a fourth leaf now before proceeding to make the stem. Do so by repeating the instructions for the third leaf one more time. Stem: To form the crochet shamrock stem: sc in ea of remaining 8 chains of the beginning ch-18. To finish: End off. Weave in ends.